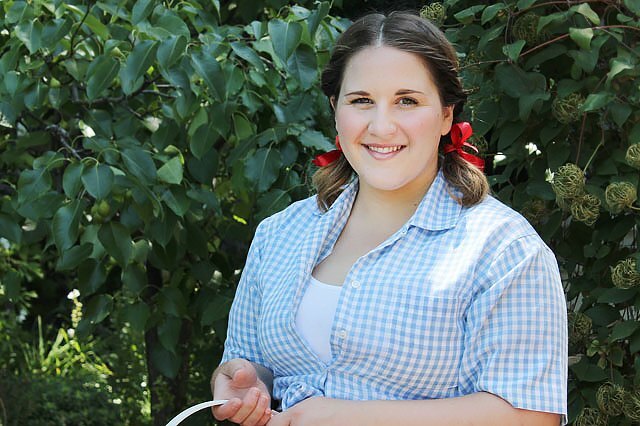 Even without sewing skills, you can still create a wonderful Dorothy-inspired costume for Halloween at the last minute. 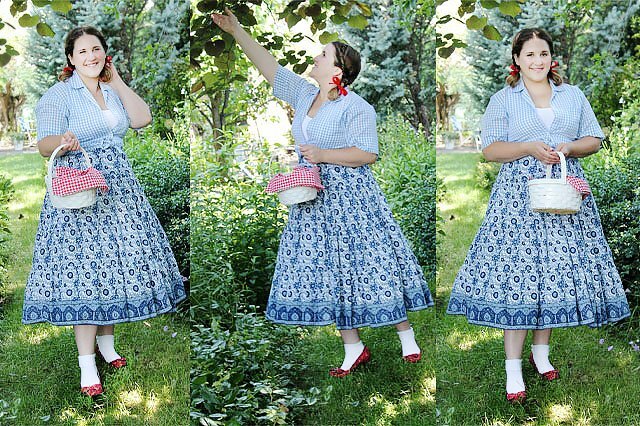 Just click your heels three times and head to your nearest thrift store to find the items you need to make a fun, no-sew Dorothy costume for Halloween. 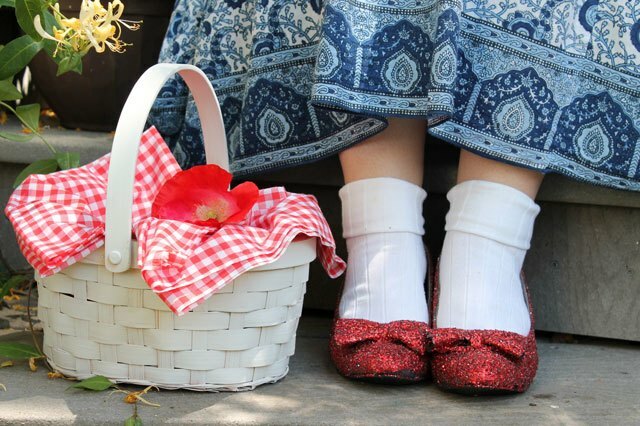 When shopping for possible items to use in your costume, look for iconic Dorothy pieces such as blue gingham, high heel shoes with a bow, white ankle socks and a basket. 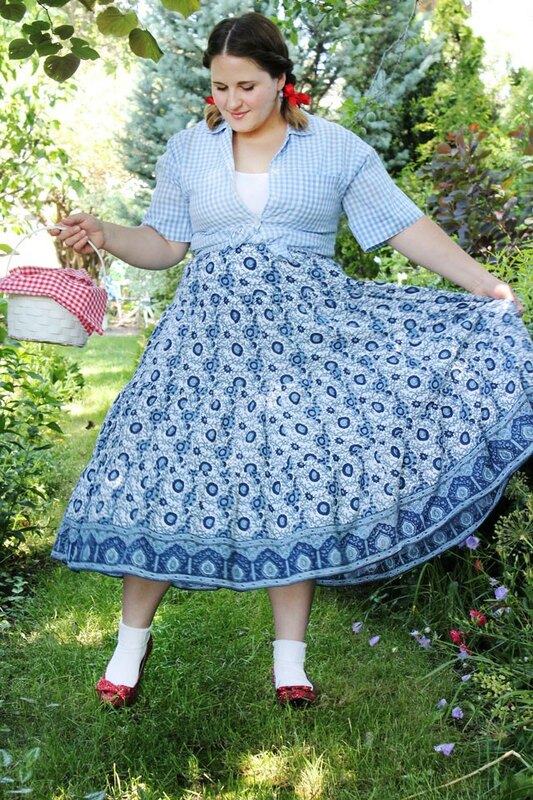 If you aren't able to find a secondhand blue gingham dress, you can use a blue gingham button-down shirt paired with a blue print full skirt. Your costume doesn't have to be an exact replica of the movie costume as long as the most recognizable pieces are included. No Dorothy costume would be complete without a sparkling pair of ruby slippers. Make your own out of a regular pair of pumps. To create the quintessential ruby slippers, gather a small foam brush, white glue, red glitter and some high heel thrift store pumps with a bow. Place the shoes on a large piece of paper to protect your work surface. Start by dipping the foam brush into the glue and spreading it directly onto the outside of the shoe in a small area. Sprinkle the glitter onto the area of the shoe covered with glue. Continue to spread the glue and sprinkle the glitter until the entire shoe is covered with the red glitter. Let the shoe dry for a few hours and repeat the process to ensure the shoe is completely covered with glitter. 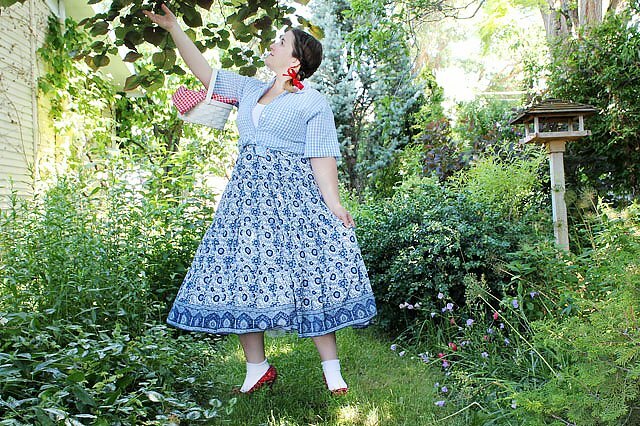 Wear white ankle socks with your ruby slippers to give it the recognizable Dorothy look. 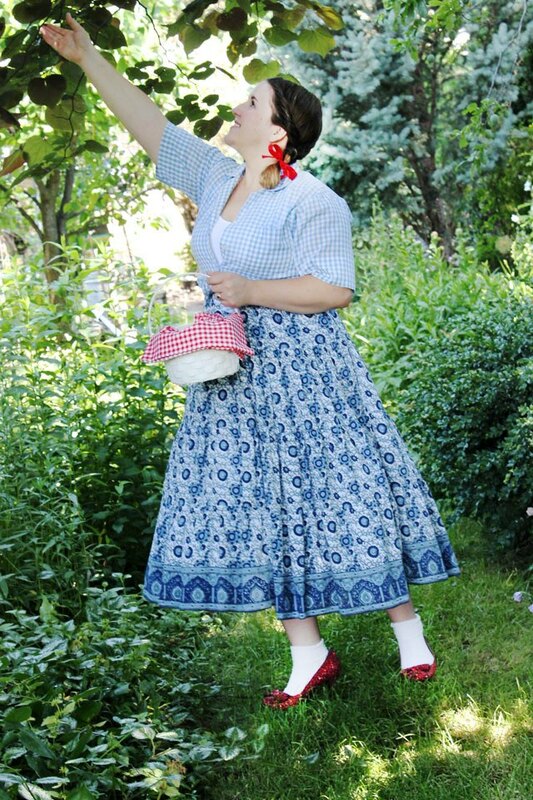 Be sure to include some type of basket with your Dorothy costume. 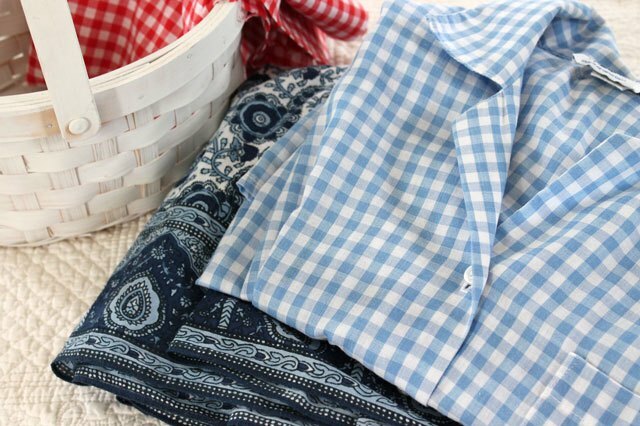 Thrift stores are filled with a variety of baskets, so you can get creative with this piece of the ensemble. A nice folded piece of fabric placed inside the basket will complete this part of the costume. 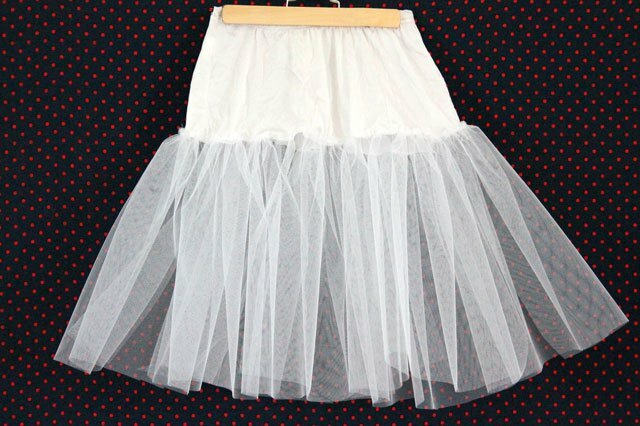 To create some dimensional drama with the Dorothy costume, add a crinoline under the skirt. If you don't happen to own one or if you can't find one in a thrift shop, you can easily make one of your own. Wear the crinoline under the skirt to make the skirt more full and dramatic. To recreate Dorothy's hairstyle, part your hair down the middle and take a 1-inch piece of hair on one side at the front hairline. Twist it inward until you get to the bottom of your ear. 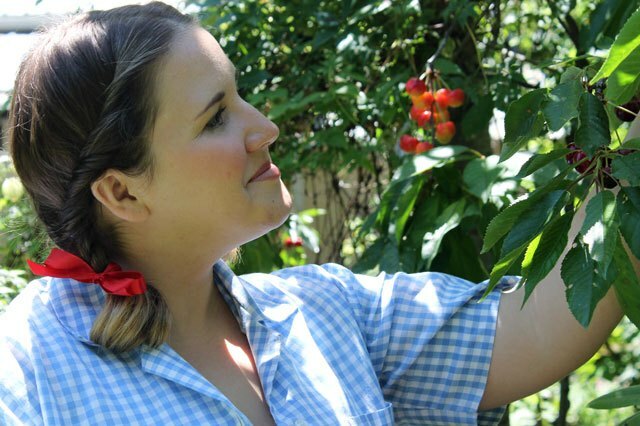 Gather the rest of the hair on that side, divide it into three pieces and braid downward. Fasten with a hair band and a ribbon. Repeat this process on the other side of your head. 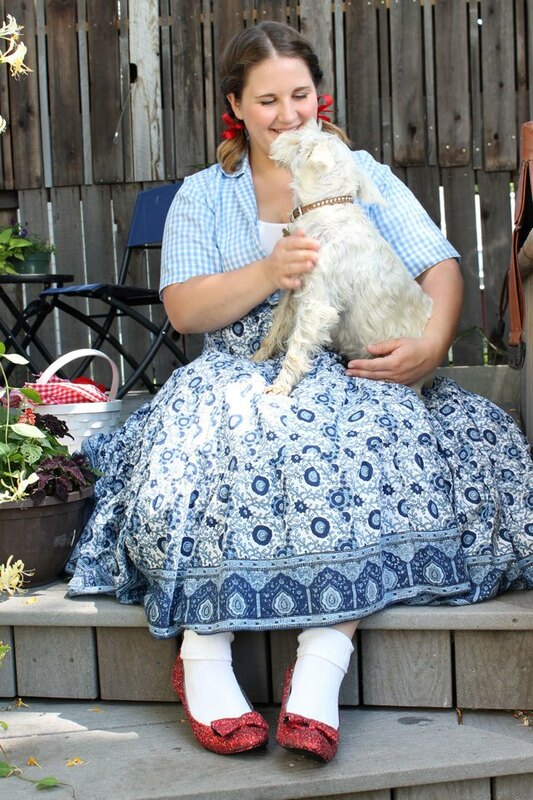 And if you're lucky enough to know a small, friendly "Toto" dog, bring your furry friend along to make your Dorothy costume even more authentic. Now you'll be looking good when you head down that yellow brick road the next time you're off to see the wizard.